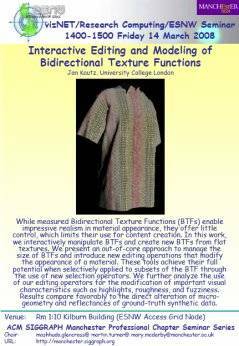 While measured Bidirectional Texture Functions (BTFs) enable impressive realism in material appearance, they offer little control, which limits their use for content creation. In this work, we interactively manipulate BTFs and create new BTFs from flat textures. We present an out-of-core approach to manage the size of BTFs and introduce new editing operations that modify the appearance of a material. These tools achieve their full potential when selectively applied to subsets of the BTF through the use of new selection operators. We further analyze the use of our editing operators for the modification of important visual characteristics such as highlights, roughness, and fuzziness. Results compare favorably to the direct alteration of micro-geometry and reflectances of ground-truth synthetic data.